Seriously – you blog readers of mine!!! I don’t know how many there are of you, maybe it’s just ten or eleven, I never look at stats ever so I honestly don’t know, but you are some of the sweetest, kindest, and most wonderful people on the planet. I wrote a blog post about not having babies and so many of you left a comment, emailed me, or left a message on my Facebook page SUPPORTING ME. I have to say I felt a bit nervous putting it all out there because MOST people DO have babies and so the fact that I am in the teeny tiny minority leaves room for a lot of judgment and criticism. But no one did that. Seriously. I only got one “spam” comment and I couldn’t even read it because it was in a different language so for all I know, she could have been saying thanks to me, too. Shoulder shrug. Once again, thank YOU for reading my posts, for reaching out, for being so sweet and positive to me. I appreciate YOU! Okay . . . onto today’s post. I was asked to share my schedule. Now this makes me LAUGH. Because my schedule is a big hot mess. I wanted to leave a comment about how she didn’t really need to spend money on an actual planner. A sticky note could do the job. But that’s just rude. So I didn’t. It’s not her fault I envy her 25 year old life of NOT HAVING TO GO ANYWHERE FOR A JOB. This is my current schedule. Keep in mind that I teach in California which means we have ZERO Specials. I had no idea Specials even existed until I started following blogs six or seven years ago and the teachers kept talking about dropping off their kids at P.E. or Music or Art and I was like . . . um . . . hello? . . . I AM the P.E. teacher! And the Music teacher! And the Art teacher! So keep that in mind. Also keep in mind I work in a district with a super amazing union who actually fights really hard for us . . . so I am grateful for that. I’m only sharing my school schedule unless you really want a play by play like Mix and Match Mama sometimes does in a Day in the Life type of way — leave me a message in the comments if you want that! HA! Okay, seriously, for real, here we go! I’ll just show the “highlights” here and then if you want more details, scroll down for ALL THE DETAILS BECAUSE YOU KNOW I’M LONGWINDED. 12:10-1:40 Depending on the day, we are either in Computer Lab for 45 minutes, the Library for 30 minutes, it’s Early Dismissal Day, or it’s Friday. So even though this seems like a decent block of time, it is not. We are usually out of the room until 1:00pm. And there you go! Also crammed in there is P.E. which is generally Go Noodle because our school schedule is PACKED with back to back recesses and lunch from 10:30 until 2:00 because we are split into three groups: 1st/2nd Grades and 3/4th Grades and 5/6th Grades. We have TK and Kindergarten, but they are half day and have their own playground so they’re not in our “mix”. Getting time on the playground or the grass for “regular” P.E. is pretty much almost impossible. We sometimes try after last recess at 2:00 and guess what? The whole school is out there with us, no joke. Our TK teacher pulls the First Grade kids who need ELD in two different groups from 2:00 to 2:57 (she does not have a TK partner so her afternoons are free and she does this for us out of the goodness of her heart). We also have an intervention teacher who is pulling two groups of First Grade kids during the 10:45 to 11:25 block. And don’t get me started on the kids being pulled for Speech, OT, APE, Steps, and Resource. We also have to keep our doors LOCKED at all times (beginning this year) so the knocking is NON STOP. It kills me. LITERALLY KILLS ME. I cannot take the knocking. I no longer think Knock Knock jokes are funny and I do NOT laugh. And I never say Who’s There. Okay so amongst all of the interruptions that I’m sure you have too, not to mention the PHONE RINGING, I get some teaching done. You can read on if you want the nitty gritty details! 8:45am We meet our kids out on the playground. There is NO trickle of kids coming in at all hours. They’ve been eating breakfast/playing on the playground before we pick them up. They can come at 8:15am but NOT to our rooms. I greet each student on the playground with a hello, hug, hi, shoulder pat, SOMETHING, and I greet them BY NAME, and we are currently working on SAYING HELLO BACK TO ME SINCE I AM A PERSON, TOO. We head up to the classroom, unpack, and meet at the carpet. 8:55am Announcements/Pledge of Allegiance/Character Pledge, etc. I use my own Morning Work because it’s mine (ha) and because it’s a quick review of Language Arts and Math skills already learned. And we use The Moffatt Girls’ journals because they have picture prompts and I LOVE THEM! They come with or without sentence starters and I use the ones WITHOUT because I want my kids to have more freedom. 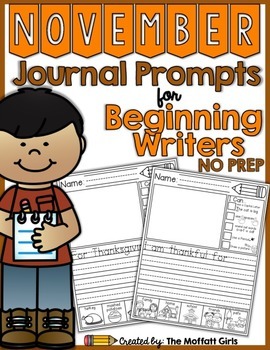 Here is an example of the November journals. We start using these in September and we always work on them together for the first week so that all students can see the expectations, etc. My team and I created a Writing Rubric and we “grade” one journal page a week and send it home so that parents can see how their child is doing. Here’s what I love the most. I say you can write anything you want. You don’t have to use the pictures at the bottom. HOWEVER, no one can say they have nothing to write about. Okay then, pick two pictures at the bottom and write a sentence for each them. I have a few kids struggling with writing so I’ll write a sentence frame on a sticky note that will work with the pictures at the bottom. For example, if the pictures are food such as turkey, mashed potatoes, corn, pie, and bread, then I’ll write “I like the . . . ” or “Look at the . . . ” and then my kids can copy the sentence frame and pick the picture that they want to complete the sentence. They can also READ it back to me. So it’s a win win. We also use the pictures at the bottom to discuss various topic sentences and what the main idea of their writing will be if they choose to use those pictures. It’s just awesome! 9:00-9:35ish While kids are working on their morning work and journals, I’m pulling a reading group, and two parent volunteers have arrived to also pull reading groups. My volunteers pull the HIGHEST groups. These kids are AT or ABOVE grade level. I pull the below grade level groups. After about 15 or 17 minutes, we send the kids who were in a reading group back to their seats, and we each call one more group. Again, my volunteers are reading with AT or ABOVE grade level students. I am pulling the below grade level groups. If a parent can’t show up, then I’ll take three groups and the other parent will take 3 groups and we just shorten the time. My whole grade level does this and we’ve been doing reading groups like this for about four years now and it is AMAZING! I try to meet with my high kids at least once a week to check in and see how things are going. 9:35ish I read a book for PURE ENJOYMENT. Of course, if something comes up that we’re focusing on (such as cause and effect, or text to text connections, or compare and contrast, or sequence of events, etc), the kids might bring it to my attention, or I might mention it, but the whole point of the read aloud is for PURE ENJOYMENT. I can’t NOT do this. It is one of my most favorite parts of the day. I feel like this is what gets my kids excited about reading. I’m animated, I do crazy voices, I scream and yell if the sentences have exclamation points, I make my crazy expressions . . . it’s just so fun! We recently adopted Benchmark Advance. You can read my thoughts about it HERE. I’m making some headway, but not a lot. We use their Phonics and Spelling program (although we’ve adjusted several word lists to meet our students’ needs and to make them more appropriate for first grade) and we use the Shared Reading books for close reading. I supplement the curriculum with all sorts of things, and utilize TpT whenever possible. I am loving Susan Jones’ Interactive Read Alouds to focus on weekly comprehension skills. And I love Miss DeCarbo’s Vocabulary Units. Our district uses Step Up to Writing which is how I teach narrative, expository, and opinion writing. I love Step Up to Writing and my kids are super successful because of it! We just finished up a Bats unit by Jodi Southard. Monday, we will be kicking off a Native Americans unit which is not on TpT. It’s just a bunch of fun hands-on activities my team has gathered and created over the years. It’s one of my favorites! I’ll have to try to figure out a way to share them . 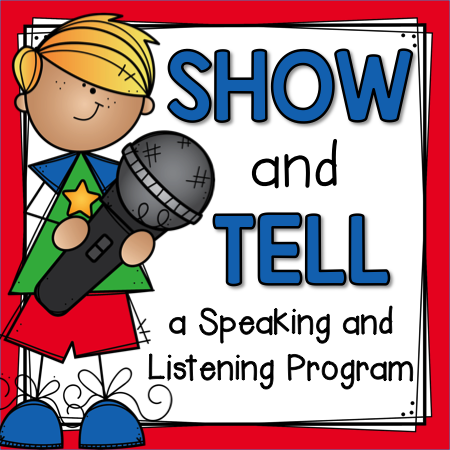 . .
1:30-1:40 Show and Tell! We call this Sharing in our room and it is one of our most favorite times of the day! My kids LOVE it when it’s their sharing day. It’s not the old school Show and Tell – it’s new and improved! It’s purposeful, meaningful, and covers so many different listening and speaking standards. And did I mention my kids love it? So do the parents! We get it done in ten minutes a day and it’s a “feel good” session. I had a substitute aide in my room once this year and she couldn’t get over this time in our day. She kept saying how amazing it was. I eventually had to take a bow to get her to be quiet. 1:55-2:57 We grab our backpacks off the hooks before coming in the room (backpacks are outside and we’re outside because we’ve just walked up from the playground) and clean out our cubbies before we do anything else. I started this a few years ago and really like it. There’s no “last minute rush” or panic feeling at the end of the day. After packing up, we meet at the carpet for a chapter of Junie B. Jones. Again, pure enjoyment. You can read all about how I feel about Junie B. Jones HERE. Then we break out into our Centers. Here’s why I do Centers at the END of the day. It’s the END OF THE DAY. My kids no longer want to listen to me teach. Our Kinder program is still half day so the END OF THE DAY is super hard at the beginning of First Grade. It’s the END OF THE DAY. I am tired. So! I have written several posts on how I run my Centers. You can start HERE. During Centers, I pull kids for intervention. For example, it’s November 3rd. Is there anything in my schedule that you need more clarification about? Or is there anything that surprised you? Is your schedule similar? Do we get too many recesses? HA! Junie B. Jones always makes me laugh. We have one 20 minute recess in third grade, but it works out okay. I have duty, but I get a 40 minute special every single day! We use enVision at our school too. (We just got enVision 2.0 which is basically the old program repackaged.) I love the idea of doing centers at the end of the day. Thanks for sharing!